Julie Nutting and Prima have some very darling dies out for Halloween. 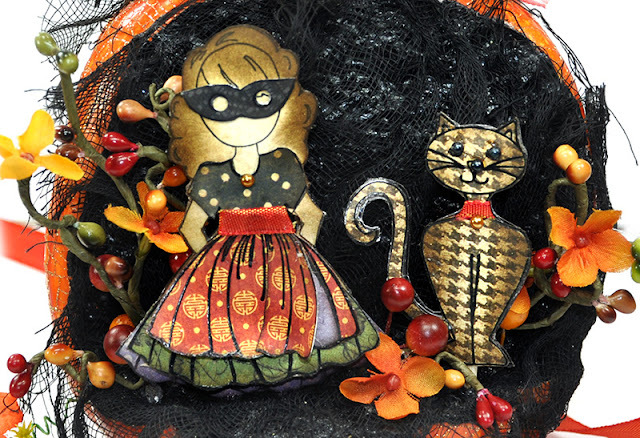 This project features "CatGirl". 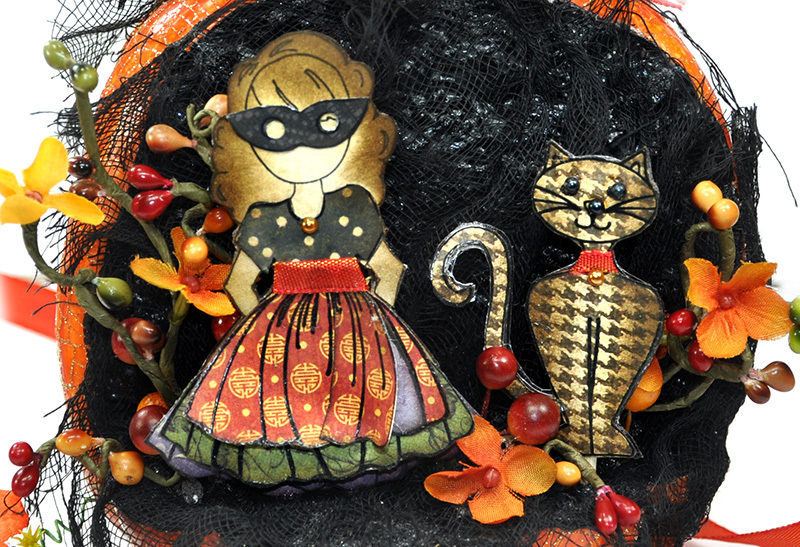 She is ready for Halloween in her costume and with her cat by her side. I have a home decor idea that can be made on the super cheap. The DIY instructions are listed down below, along with my helpful tips. 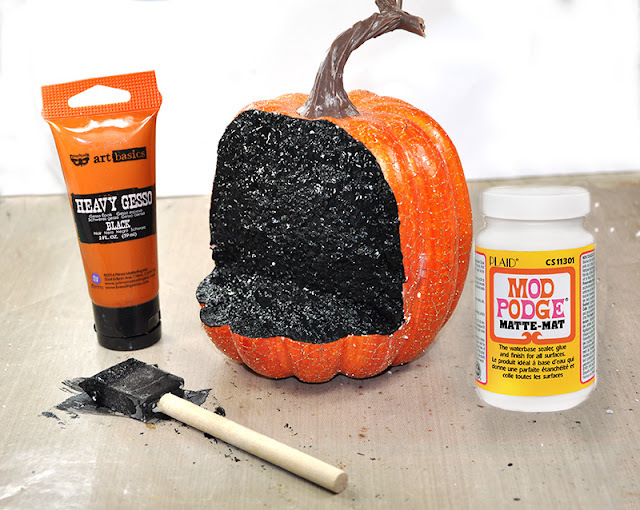 So let's see how I transformed this simple styrofoam pumpkin into a sweet Halloween centerpiece for your table. 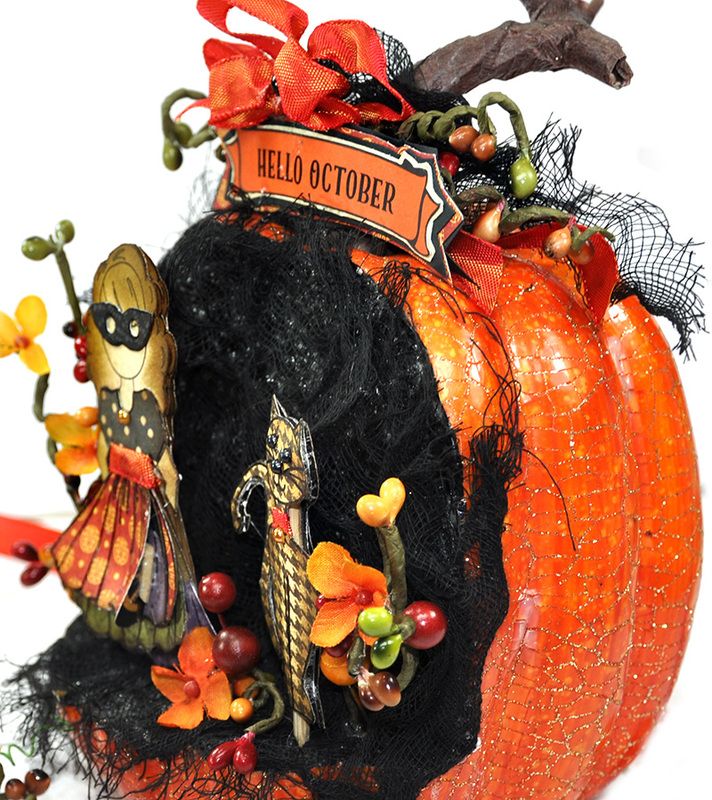 The side view provides you with a great perspective of the project and really conveys my plan for using the pumpkin as a type of shadow box or shelf. 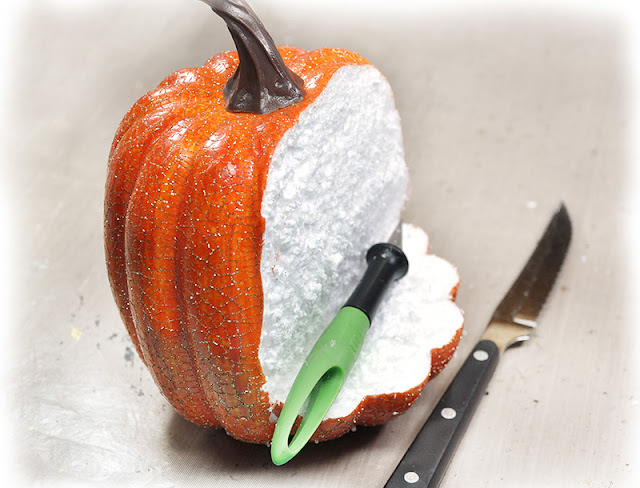 First step is to use a super cheap pumpkin. 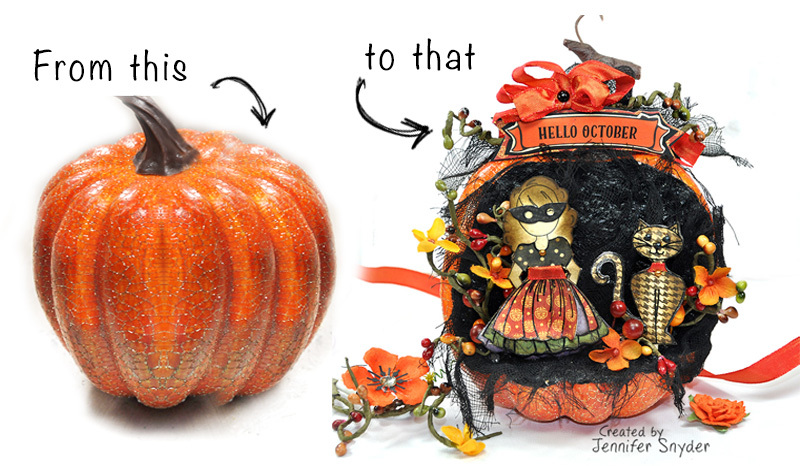 I started off with a styrofoam pumpkin that I bought on the cheap - 50% off with an additional coupon. Yippee. I knew I was going to be cutting it and needed something super cheap that didn't make me sob like a baby if my project was an utter failure or the pumpkin crumbled into a styrofoam mess. I also made sure I grabbed a pumpkin that wasn't too large for the same reason above plus more. 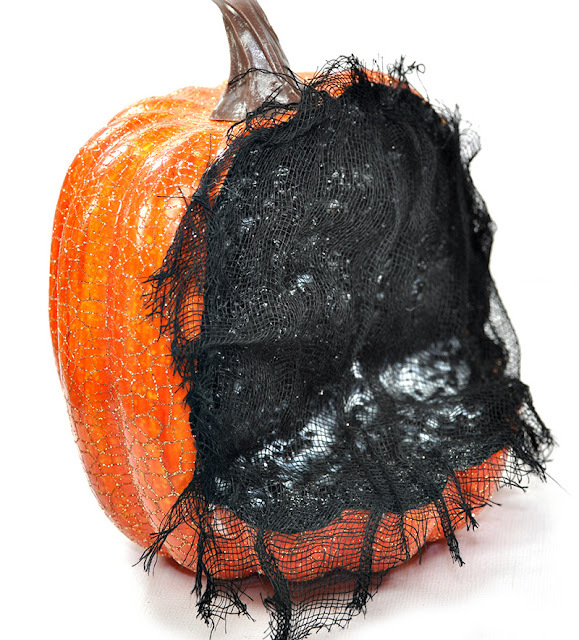 Big pumpkin = big mess or big flop - maybe even both...big floppy styrofoam pumpkin guts all over my floor. Oh my gosh - those tiny wretched styrofoam balls create static cling and it's impossible to get styrofoam off clothing AND cat/dog fur. . The pumpkin I chose actually had a nice outside crusty shell which seemed to hold the shape perfectly even after I cut into it. I used my kitchen knife paired with a craft knife. Probably not the best for my kitchen knife BUT what's done is done. I cut a wedge into the pumpkin to use as a "shelf" for my dolls to be placed. 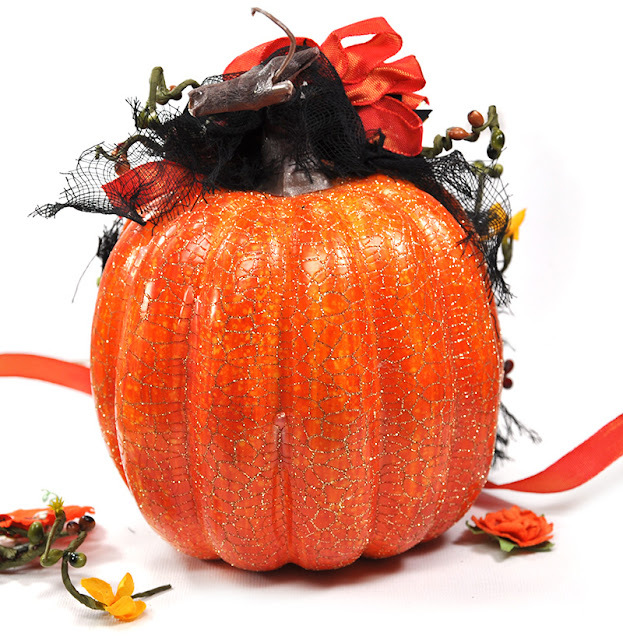 I am actually using this pumpkin like a shadow box or a pumpkin shelf. Step 2. Paint and Seal the Styrofoam. After you are successful and happy with your handy cutting job, you really need to consider some way to seal the exposed styrofoam lest it continues to shed it's nightmare of devilish white static cling balls everywhere. OK you get the picture. Plus you won't be able to preserve the project very well for future display unless you tackle this beast right here and now. 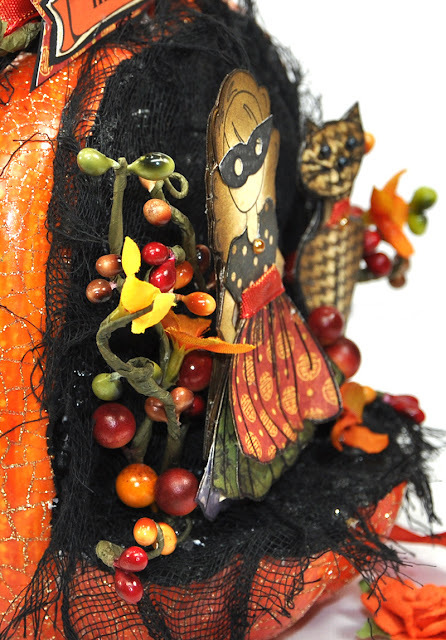 I painted mine with Prima's Glossy Black Gesso - which acts as both a sealant and a paint. After AIR drying completely, I wasn't really satisfied. I still thought it was too fragile and would still crumble apart so I added an additional layer of ModPodge - gobs actually. 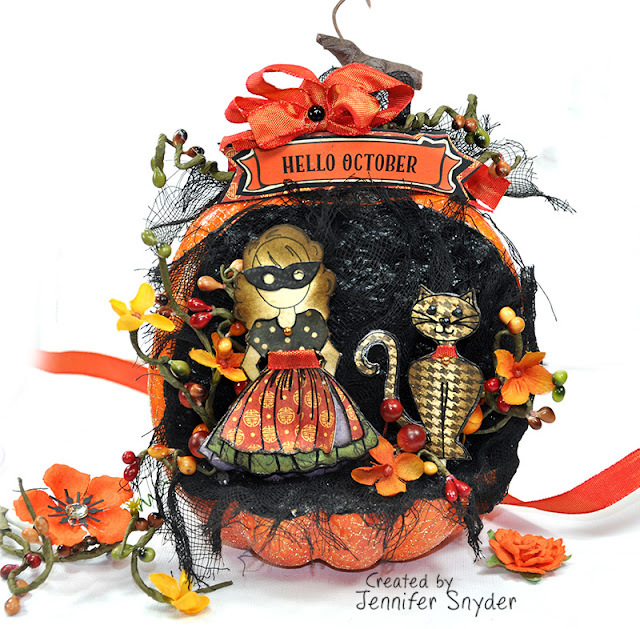 Gobs of ModPodge. (You can use white school glue and water mixture as well). This step needed to also AIR dry. But seriously folks - this needs to air dry. Go bake some brownies or take a nice walk and admire the leaves. It's better than calling the fire department. After I painted, I was still scrunching my face in disapproval. It looked OK - clean and crisp however it also looked like painted styrofoam. Not a quality look. 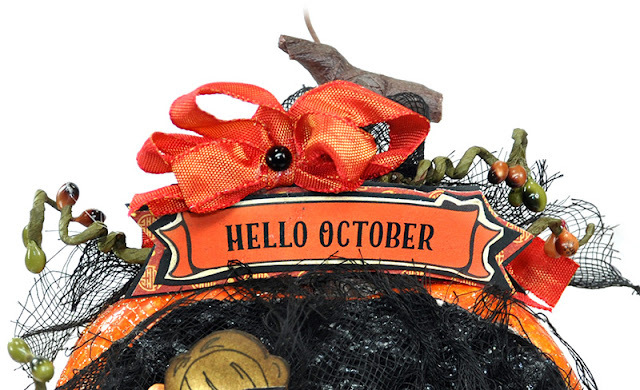 I covered the pumpkin shelf with black cheesecloth that I grabbed at the dollar store. I cannot be entirely sure about this - because I've never tested my theory, however I'm going out on a limb to and say that this is the only time of year you are gonna find black cheesecloth so go to the dollar store and buy a few bucks worth of stash. In the photo below, you can see the white ModPodge gobs are not dry yet but that is OK because it is a glue-like substance and will help to secure the cheesecloth. Like I mentioned earlier, I want this project to be like a shadow box with cool depth and dimension. Thus my dolls can't be flat. They certainly cannot be flimsy and vulnerable to folds and creases, rips and tears. This one time at Halloween that RIP doesn't mean "Rest in Peace". It means " you ripped your doll and now you need to start the dang doll over" because she's lost an appendage or some such other misfortune. Not good. 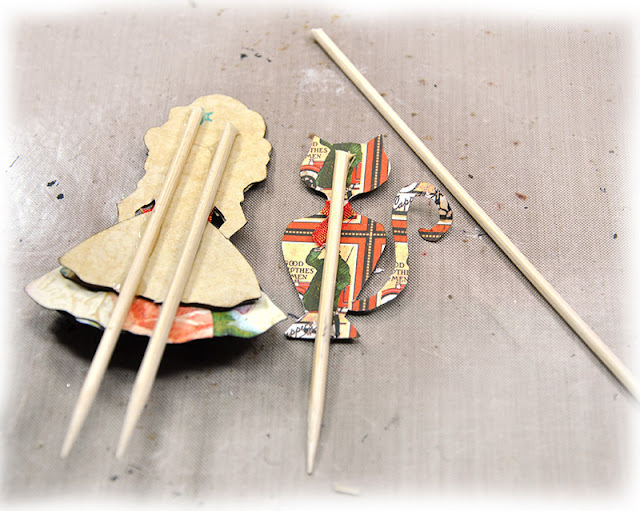 To make her sturdy and durable, I simply cut 2 or 3 doll shapes. I decorate one to be used as the front. I add some wood skewers and then add then glue the remaining layers to the back. No need to decorate the back layer. It will be facing the pumpkin. The wonderful thing about styrofoam is that it provides a su[pportive medium for your dolls to stand up. I did add some glue to the ends of the wood skewers before sticking the dolls into the pumpkin. I'm not too sure I need to add too much detail here. 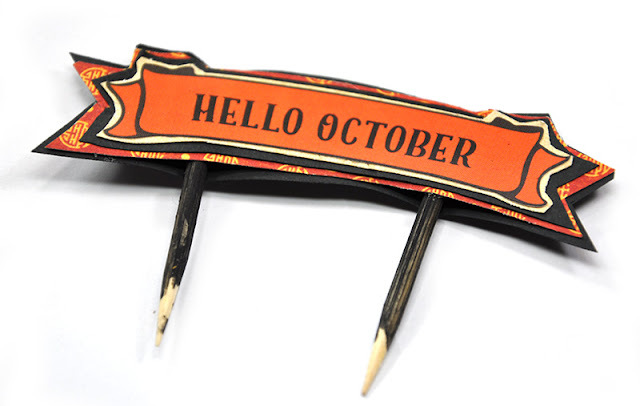 The wood skewers will be handy to stick into the top of the pumpkin to hold the halloween sign secure. i did paint the skewers black for added camouflage. Now you can decorate as you desire. I actually kept the embellishments simple. I used some generic pre-wired floral vines for the background. The wires were perfect for poking into the styrofoam pumpkin. Add a dab of glue and all is great. One last finishing tip...I had some brown floral tape handy so I did wrap the stem in brown tape. It looks a whole lot better wrapped in brown floral tape than just the original brown plastic. And this is how the back looks. For once, the back of my project is as pretty as the front. wow ....that NEVER happens. Enjoy and thanks for stopping. This piece is available in my ETSY shop - while available. You can find the direct link right here. 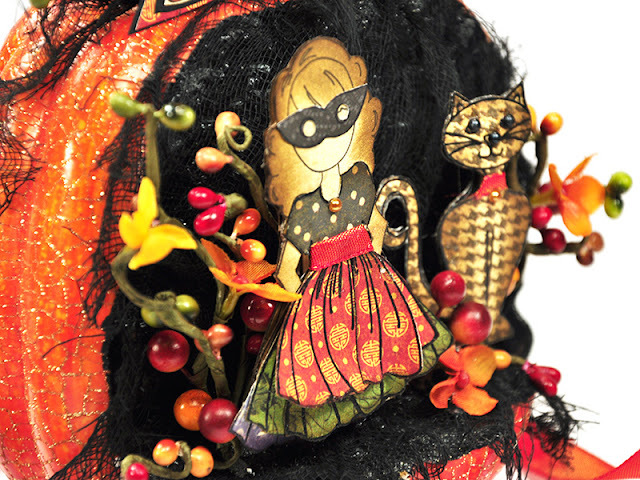 I'll be adding a few other Julie Nutting Halloween pieces in the next few days so keep watching. 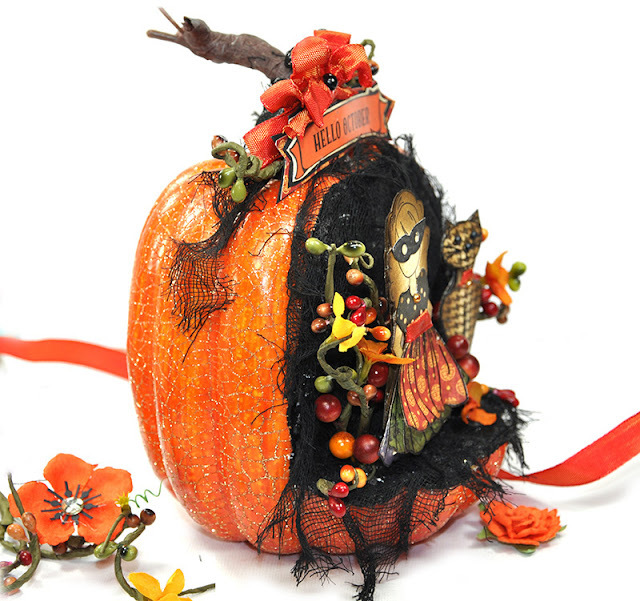 This is fun and i can see my granddaughters enjoying this craft.. my 13yr old granddaughter is dancing in a spook house we have annually and she is getting into the spirit of the holiday.. This is an amazing piece!!!! Thanks for the detailed tutorial!! Thanks for sharing. My grandchildren would love this. You are just too freakin cute......funny, and talented......one crazy lady.....love this.